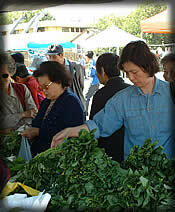 Shoppers inspect the produce at the recently opened Chinatown Certified Farmers' Market, the first one in a multicultural district of Los Angeles. California law requires that a certified farmers' market operator must be a nonprofit organization, a local government agency or a farmer. Market Operators are responsible for all aspects of running the market including compliance with State, County and Local regulatory requirements, legal and financial liability, staffing, product mix, etc. It is always best to hire experienced market management or to acquire the training necessary to operate the market yourself. To succeed, a CFM needs a broad support of the community it serves. You will need to recruit a hard-working, capable core of volunteers to help organize the market. The importance of a core group of volunteers cannot be over-emphasized. This group needs to reach out to the many stakeholders in your community and solicit the support of community organizations, governmental bodies, religious institutions, schools, retail business associations and other neighborhood organizations. The success of your market may well depend upon the efforts you make to involve as many interested partners as possible in your community. This is a lot easier when a dedicated group is willing to do the work needed to get the market off to a successful start and continue to guide the market once it is opened. What is the image of the location  is it a public space welcome customers, is it attractive and safe? Are there other CFMs operating in the area that would compete with your market? Are there commercial markets that offer similar kinds of produce in the area? Are there good roadside stands, quality small markets, or mobile produce vendors? What day of the week and likely market hours would work best at this location? Markets have been successfully started with as little as $2,000 and as much as $150,000. It will be up to you to determine how much you will need to get a market up and running. It is important to remember that a certified farmers market is not a profit making enterprise. It may take several years for a market to just break even. Some of these expenses will be offset by revenues generated by the market, but it is best to assume that you will need to subsidize the operating expenses of the market for the first eighteen months. You may recruit farmers in one of two ways. First, visit markets in your area and get to know the growers who are participating in these markets. You may discreetly Recruit growers at these markets as long as your market is not in direct competition with the market. A better way of identifying growers to participate in your market is to work with an existing organization to help select the farmers that would work best in your market. Take the time to recruit growers carefully to be sure they support purposes of the market. Southland Farmers' Market Association offers consulting services to determine the feasibility of a prospective farmers' market. Click here to Learn More.